Suppose you want to show articles on your frontpage layout in different colors, depending on how old the article is. You can do this with a little bit of work using a template override. 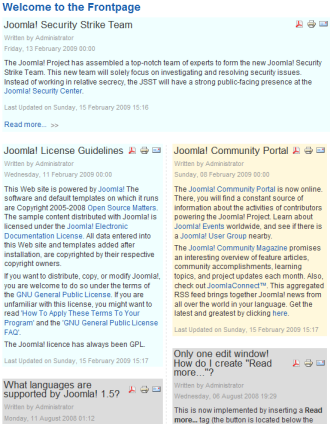 Here is a general link about template overrides: http://docs.joomla.org/How_to_override_the_output_from_the_Joomla!_core. The file you need to override is components/com_content/views/frontpage/tmpl/default_item.php. You would copy this file to <your template>/html/com_content/frontpage/default_item.php. Depending on your template, this file might already be there as an existing override file. In that case, just modify that file. For this example, we'll use the rhuk_milkyway template, so I copied it to templates/rhuk_milkyway/html/com_content/frontpage/default_item.php. Ok, here is the idea. At this point in the program (when we're in the default_items.php program), the article create date is available as $this->item->created. So we can use that date, compared to the current date, to see how old the article is. Then we can add a different CSS class for articles of different ages. This new class just has a constructor and one method. In the method, we're setting the class to "dateCurrent" if it's less than 7 days old, "dateLastWeek" if it's 7 to 14 days old, and "dateOld" if it's more than 14 days old. Notice that we use the require_once statement. We need to use this (as opposed to the include statement) because this code gets executed multiple times, once for each article. So the require_once statement makes sure we only include this file the first time. In line 11, instead of adding the Page Class Suffix, we're adding the special date CSS style by calling our new method. Notice that there is a space between the "contentpaneopen" style and the new date style. That is important, since that adds the date style as a second CSS style instead of changing the name of the contentpaneopen style. So our new "dateCurrent" class is being added as a separate class. The exact location of where you use the new classes will depend on your template and what type of styling you want to do. 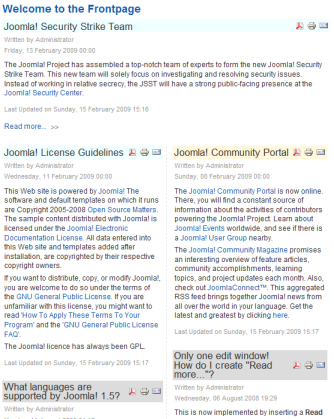 This page was last modified on 19 January 2011, at 12:51.